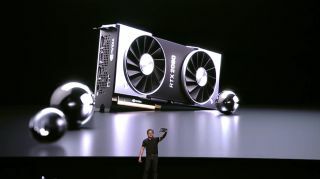 At Nvidia’s Gamescom 2018 press conference, the company, as expected, announced its latest high-end graphics card: the GeForce RTX 2080. Since then, we've had time to properly put the RTX 2080 through its paces, and run a number of benchmark tests (and play a number of games) to see just how well it performs. We also want to see how well it stacks up to its predecessor, the GTX 1080, so we've compared the new GPU against its older sibling to see how much of a leap in performance the RTX 2080 provides, and whether or not you should upgrade. When the GTX 1080 first launched on May 27, 2016, it sold for $549 (£529, around AU$900), while the Founder’s edition sold for a bit more. With the RTX 2080, Nvidia is selling it for $799 (£749, AU$1,199). Considering the performance leap between the GTX 1080 and the RTX 2080 (which we’ll look at more closely in a moment), this is a pretty impressive amount of power for the money. Of course, it’s not cheap, but we were not expecting Nvidia’s next generation high-end GPU to be a budget affair. Those prices are for Nvidia's Founders Edition of the card. You can also find RTX 2080 cards from other manufacturers starting from $699 (£749, AU$1,199). However, since the launch of the GTX 1080, the GPU has had a few price cuts (when it wasn’t being inflated by cryptocurrency miners), and we’d expect its price to fall further once the RTX 2080 is out. Because the GTX 1080 is still a very capable card, it means you could pick up an excellent bargain. The GTX 1080 comes with 8GB of GDDR5X memory, with a 10Gbps memory speed, 256-bit memory interface and a memory bandwidth of 320GB/sec. The base clock is 1,607 MHz, with a boost of 1,733 MHz, and it comes with 2560 Cuda cores. Overall, the GTX 1080 is capable of 9 teraflops of computing power. Meanwhile, the Nvidia GeForce RTX 2080 comes with 8GB of GDDR6 memory with 14Gbps memory speed, a 256-bit memory interface and 448GB/sec memory bandwidth. Its base clock is 1,515 MHz with a boost of 1,710 MHz and it features 2944 Cuda cores. There will also be a GeForce RTX 2080 Founders Edition that will have an overclocked boost clock at 1,800 MHz. These specs show a big boost in performance for the RTX 2080 over the GTX 1080, with faster video memory and a lot more cores. The architecture changes we mentioned earlier will also help the RTX 2080 blow past its predecessor when it comes to performance. As soon as we get our hands on an RTX 2080 we’ll properly pit it against the GTX 1080 to see how the new card really stacks up. While the RTX 2080 vs GTX 1080 fight looks pretty clear-cut on paper (with the newer GPU soundly beating the older card), how do they compare in real-world tests? First of all we ran a suite of benchmark tests on both cards to see how they performed, and you can see the results below. As you can see from even a brief glance at our charts, the RTX 2080 is a much stronger performer than the GTX 1080, so even if you already own the GTX 1080, an upgrade to the RTX 2080 will see a decent performance increase. However, these results also show that when under load from complicated graphical tasks, the RTX 2080 runs hotter (and needs more power) than the GTX 1080. We also ran a number of games with both the RTX 2080 and the GTX 1080, and it's in these results (above) where you can really see the benefit of picking an RTX 2080 vs a GTX 1080. In every game, the RTX 2080 demonstrates that it can provide a large frames per second advantage over the GTX 1080 - both at 1080p and 4K resolutions. The RTX 2080 even comes within touching distance of 60 fps at 4K resolution in Middle Earth: Shadow Of War. This is seriously impressive stuff. Back in 2016, the GTX 1080 was a showcase for Nvidia’s Pascal GPU architecture, which introduced the company’s 16nm FinFET process. This allowed for improved efficiencies, higher densities of transistors, and increased performance. Meanwhile, the GeForce RTX 2080 is based on Nvidia’s highly-anticipated Turing GPU architecture. This features the debut of RT Cores, which are specialized cores used to compute how light and sound travel in a 3D environment at a rate of up to 10 GigaRays. They should allow Turing GPUs like the RTX 2080 to process real-time ray tracing 25-times faster than Pascal architecture. According to Nvidia, its Turing-based GPU nodes can outperform CPU nodes by 30 times when used for final-frame rendering for film effects. While this applies to the professional Turing GPUs like the Quadro RTX 8000, Quadro RTX 6000 and Quadro RTX 5000, gaming and consumer GPUs like the RTX 2080 could also see the benefits of this tech. Nvidia GeForce RTX 2080 vs Nvidia GeForce GTX 1080 conclusion: should you upgrade? So, now we've had time with both the GTX 1080 and the RTX 2080, we can safely say that if you want one of the best graphics cards ever made, and you'd even like to dabble in gaming at 4K, then the RTX 2080 is a brilliant choice, especially if the even more powerful (and expensive) RTX 2080 Ti is too pricey. If you want to save money, then going for the GTX 1080 is a fine choice, and will save you some extra cash to spend on games. Just don't go expecting 4K resolutions at full graphical settings and blisteringly fast frame rates. Already have a GTX 1080 and thinking of upgrading? Well, if you have the cash, we'd say go for it. You'll get a fantastic performance leap over the GTX 1080 with the RTX 2080, and you may even be able to sell on your GTX 1080 for a decent amount of money to help lessen the blow to your bank account when buying the RTX 2080.